Within the strict confines of Aresti figures and without the smoke or music, it is possible to beat Rob Holland in international competition, if you happen to be among the very best pilots in the world. But you might as well just watch him fly the four-minute freestyle, the apotheosis of the airshow art, enjoy the show, and strap it on in pursuit of second place. Holland, who won the freestyle title in the 2015 Fédération Aéronautique Internationale World Aerobatic Championships in August, notched another first-place finish in his signature event during the FAI World Air Games in Dubai, United Arab Emirates. 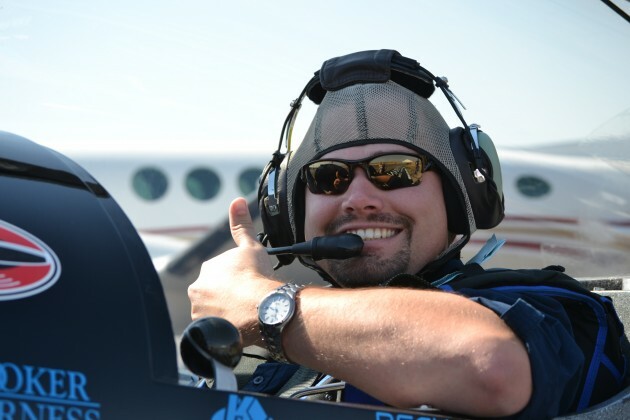 Holland finished third in the overall powered aerobatic competition, which he noted in a Dec. 5 Facebook post, but left it to others to acclaim his latest freestyle victory. Martin Sonka, a Red Bull Air Race champion representing the Czech Republic, managed to come within 177.66 points of Holland in the freestyle, amassing 78 percent of the potential points for that flight (trailing Holland’s 83 percent). Olivier Masurel of France (winner of the powered aerobatics overall competition) finished third in the freestyle, 25.45 points behind Sonka, who placed fourth in the overall powered aerobatics competition. The margin between victory and last place can be surprisingly thin in aerobatic competition, and American glider pilot Eric Lentz-Gauthier got a taste of that in Dubai, with a disqualification in his own freestyle flight that dropped him to the bottom of an international field of nine glider pilots. Judges determined that he strayed outside the bounds of the aerobatic box, and he lost all of the potential points for the freestyle, which in this event counted toward the overall title, unlike other international events that score the freestyle separately.